There are so many kinds of indoor flowers, it can be hard to choose just one. Prioritize your indoor gardening space by choosing a flowering plant that's best for your preferences and lifestyle. Choose a funky and bright flower for a college dorm room that needs some living decor or a stately, traditional flower for an office space. Certain flowering plants are better suited to growing indoors than others. Chrysanthemums are flowering plants of a genus of the same name. Native to Asia and parts of Europe, these plants prefer bright sunlight and plenty of it. Avoid placing chrysanthemums in direct sunlight once blossoms have formed, as the flowers are prone to scorching. 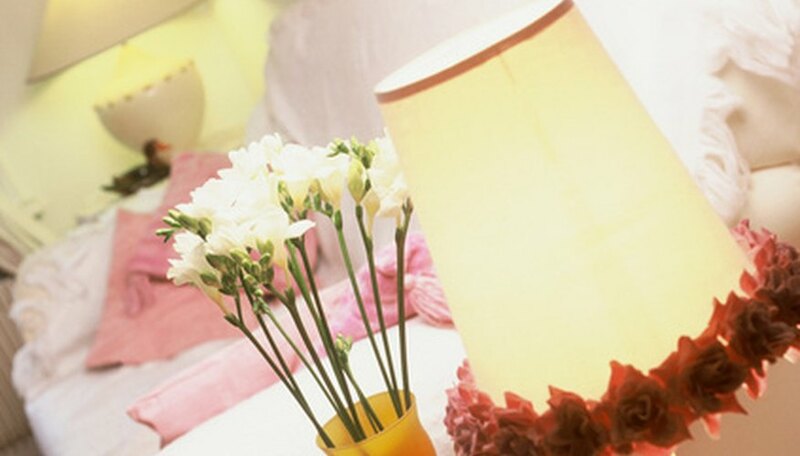 A slight breeze is said to encourage bloom formation, though chrysanthemums perform best in average room temperatures of 65 to 70 degrees Fahrenheit. Water these plants when the soil feels dry to the touch. These vibrant flowering plants were shown to reduce the amount of indoor air pollutants by the 1989 NASA Clean Air Study, making them an excellent indoor flowering plant for health-conscious gardeners. Bloom colors range from white to pink to orange and everything in between. Cyclamen flowers, or Persian violets, are a genus of flowers native to the Mediterranean region of Europe and parts of northern Africa. Characterized by heart-shaped leaves and pointed blossoms, cyclamen plants are ideal indoor flowering plants for those who need a project to nurture. The soil should be kept evenly moist. 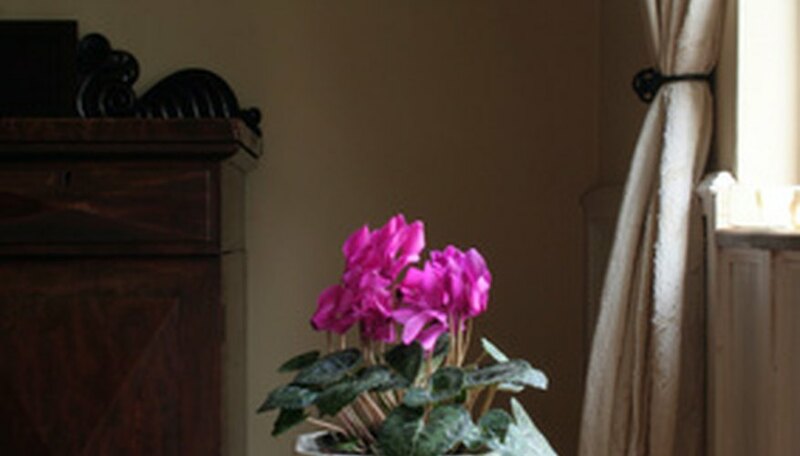 Over watering cyclamen causes rapid leaf wilting, while under watering prevents blooms from reaching maturity. Cyclamen flowers come in a range of colors from purple and pink to orange and red. The plants prefer indirect sunlight or diffused bright lighting and temperatures slightly cooler than average -- around 55 to 68 degrees Fahrenheit. The plant's temperature preferences make them well-suited to office life, but they can also thrive in a cool house. While blooming, cyclamen need to be deadheaded, or have the spent blossoms removed, to allow space for new blossoms. Madagascar jasmine, also known as bridal wreath, the Hawaiian wedding flower and the waxflower, is a tropical plant known scientifically as Stephanotis floribunda. As its common name suggests, this tropical flowering plant is native to Madagascar. Growing in room temperatures of 60 to 85 degrees Fahrenheit, these flowers are ideal for a sunny home windowsill. Madagascar jasmine prefers bright, indirect lighting and a slightly humid environment. The plant itself is a vine that can grow from 6 to 20 feet in length, making adequate supports or trailing aids a requirement. Water evenly, keeping the soil moderately moist. White, waxy flowers appear in spring and summer. The flowers fade to yellow after a few days. For optimal flower production, a cooler, winter dormancy period is recommended. Madagascar jasmine is ideal for indoor gardeners who want a crisp, clean flower with a powerful scent and a unique, trailing vine structure. How Many Hours of Darkness Do Plants Need?